How Soon Are Cannabis Clubs Coming To Colorado? Purchasing marijuana in Colorado is a simple process. Smoking your marijuana purchase is not so simple – especially if you are just visiting. When you visit Colorado, you will be delighted to find a variety of marijuana dispensaries that cater to the “recreational” crowd. The simple process of walking into a dispensary, picking out your favorite stains, and checking out is tried and true. But what do you do when your hotel won’t allow you to smoke, and the laws prohibit public consumption? The answer could soon be the fabled Cannabis Club. This year marked the second full calendar year of recreational marijuana sales in Colorado. The first year, 2014, was a year of implementation and observation, as Colorado pioneered the recreational sales model. 2015 has been a year of innovation accompanied by a mentality of “testing the waters” surrounding Colorado’s sometimes-ambiguous marijuana laws. One major area of concern for the marijuana industry in Colorado is—where should people smoke? Since marijuana was legalized, police citations for public consumption in Denver went up 471 percent. This increase indicates that people either don’t care about laws prohibiting public consumption, or they do not have a safe and legal spot to consume their goods. Denver entrepreneurs saw this dilemma as a new business opportunity—the cannabis club. First, clothing company Grassroots opened the “Break Room”, and a number of other “bring your own cannabis” clubs opened their doors in early 2015. However, on 4/20 Denver police began their raids on these clubs citing that they were operating without licenses—but there were no laws requiring a license to allow folks to smoke indoors. As a response, Denver cannabis club supporters gathered signatures for what they called “The Limited Social Marijuana Consumption Initiative”. The initiative proposed allowing cannabis use in adult-only bars around the city. There was major support for the initiative, but in September its proponents put the initiative on hold. Though there was plenty of support, the Colorado Restaurant Association began to push back over concerns that their restaurants would become less appealing to non-smokers as the clouds of smoke rolled in. So, instead of forcing an initiative that would alienate the proposed hosts of public marijuana consumption, supporters decided to revise the initiative in a way that would be successful without creating a divide in the thriving Denver service industry. Maybe cannabis clubs are half a year away for Denver smokers, but another Colorado town, Nederland, has been operating a successful club for most of 2015. 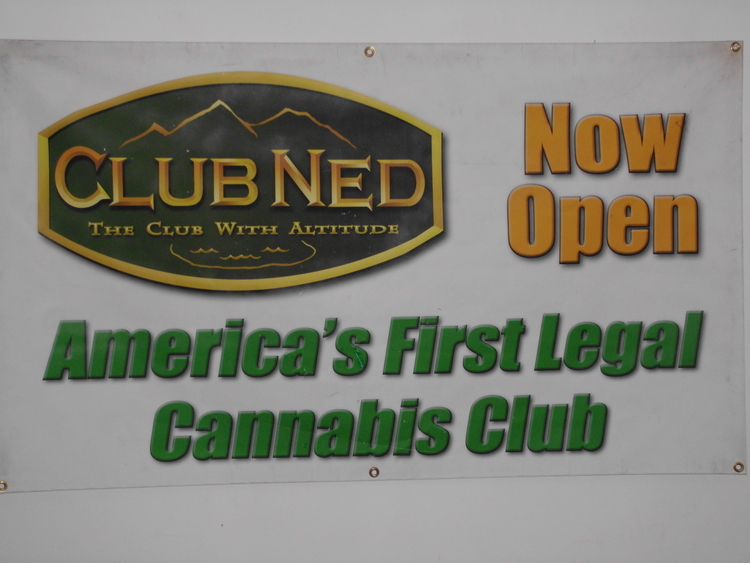 “Club Ned” is located near the center of the small mountain town and allows visitors to pay a $10 daily membership fee to come in and enjoy cannabis. Of course the club is a BYOC establishment, but there are a few dispensaries located within walking distance. There is a clear desire in Colorado and other legalized states for legislation that allows cannabis clubs. People do not inherently want to cause problems with their cannabis consumption, but when faced with the decision to smoke or not to smoke—people are going to smoke. What do you think about cannabis clubs opening in Colorado? Lets us know on social media and in the comments section below.